It was such an amazing experience to work in this 67 year old art studio - the largest in Canada - which is no longer in operation due to funding cuts. 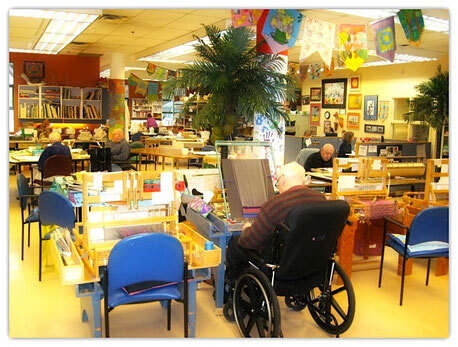 I offer you a snapshot of the art studio for older adults that I worked in for 9 years in to give you an idea of how a fully funded therapeutic art studio in residential care can be adopted for art therapists and art facilitators working with lesser budgets. See my book How to Start and Art Program for the Elderly. Our therapeutic art program has been documented in the book Art Therapy with Older Adults - A Sourcebook by Rebeccca C. Perry Magniant Artworks Studio provides individualized art projects to meet the needs of older adults with cognitive and/or physical impairments. Care is taken to assess and understand each individual's psychological, emotional and social needs on a one-to-one basis, within small groups, and within the larger social community of the art studio. The descriptions below are adapted from chapter 4 by Pamela J. Brett-Maclean and Marilyn M. Magid from the book "Art Therapy with Older Adults." “A visit to the Artworks Studio provides one with a collage impression: warm welcome, laughter, patient attention, excitement, wild creative visions, simple satisfaction, a quiet absorption, attending to the setting down of a line or a dab of color, just so, sometimes a sense of confusion, and at times frustration. The residents sometimes work together, but most often work alone in the in the presence of one another in this expansive shared studio space. The art instructors work along with them. There is a swirl of energy that connects us all, as we work side by side, sharing our visions, our experiences, our stories. Even in the quieter moments there is always, somehow, an aliveness; an awareness of not yet known, known only in the coming – wild, beautiful arresting, surprising images coming into being. It is this artistic and creative expression that enlivens the community within this continuing care facility." Artworks Studio was located in a continuing care facility that offered residential care to over 300 Canadian Veterans, ranging in age from 80 years old to over 100 years old. The facility (and Artworks Studio) originally opened in 1947 to provide physical and occupational therapy, as well as job retraining to help World War II veterans reintegrate into society from acute care hospitalization and treatment. Artworks Studio was located in in a residential suburban community near the larger metropolitan area of Vancouver, British Columbia. The Artworks Studio philosophy is based on the belief that art making can enrich life by providing a means of engaging, reflection on, expressing, and developing life stories, aspirations, and aesthetic visions, while expanding on present interests. Inherent to this view is the notion of artistic expression a mode of being, providing opportunities for imaginal, expressive, and creative engagement that enriches life and the community." As the Artworks Studio program as evolved over time it has expanded to realize a number of significant opportunities for experiencing the benefits of art making. 1.) Promote an aesthetic awareness and appreciation of, and connection with the things in the world beyond the self (e.g. nature, others, stories, materials, aesthetic form. 2.) Develop skills and/or mastery in a wide range of art and craft techniques. 3.) Provide opportunities to experience the creative process – the imaginative transformation of feeling, image or idea into some material - such that the material becomes a medium of expression. 1.) Provide a safe environment in which to work and experience creative growth. 2.) Provide friendly encouragement that served to support, motivate and challenge, and challenge residents thought the process of art making. 3.) To foster opportunities for social interaction and recognition of the resident’s creative efforts. As residents gained confidence in their skills and abilities, some found the use of a personal notebook particularly helpful in documenting their ideas and creative explorations. These notebooks often included photographs of completed works, as well as drawing of images that inspired them. In many ways , these notebooks could be considered works of art in themselves. Other residents brought photographs of their family home, family members, pets, or other evocative images into the art studio to use as inspiration for art projects. Weaving – sewing machines and serger were available to transform woven fabric into finished articles such as placemats, shawls, and tea towels. Painting – Watercolor, acrylic, latex paint on canvas, wood or glass. Fabric painting with dyes. Paper-based Arts – Drawing and sketching , collage, stamping, stencilling, printmaking. Sculpture-based Arts – Paper mache, doll-making, basket-making. Textile Arts – Needlework or stitchery, bargello ( long stitch embroidery), off-loom weaving. Art Therapy – Process focused art-making in all mediums are geared towards individualized emotional or psychological needs where the aim is on the emotional process art making and not on creating a finished project for gifting or sale. Collaborative theme based workshops were organized on special occasions in the studio. The workshop activity chosen was based on projects that everyone could do, and usually involved only one or two steps such as creating a card for Christmas or Valentine’s Day. Individualized outreach programs were offered to units for residents who were frail, sick, or reluctant to leave their rooms 4-5 mornings per week. These art-making sessions offered residents the opportunity to experience creative art projects in a quiet, non-threatening environment. Using a rolling art cart, art facilitators took materials to a resident’s room and spend about ten minutes with him or her (although these sessions were sometimes longer, depending on the resident’s interest, stamina, understanding , and enjoyment). Typically individualized outreach activities involves small art making projects such as painting a silk scarf, making a card, or using a brush to add color to an art project. Group workshop sessions were organized four or five times a week on each of the residential units. As individuals become frail or confused, they often prefered to work on art-based projects in a quiet and familiar setting. Organized group-based workshop sessions also provided an option for residents who were unwilling to attend Artworks studio due to due to uncertainty about involving themselves in the art process, or committing themselves to a long-term project. Although residents in attendance were encouraged to participate in some way, they are not required to do so. During group sessions, residents came and went as they wished.